Tradional hand hooked RUGS in all different sizes, shapes, and designs. ALL UNIQUE! ALL personally designed, hand drawn, and hand hooked! If you have an idea for a rug and would like a quote on a custom rug, please click on "Contact Us and Directions" page and send WHITE CAT WOOL a message with your ideas. We'll get right back to you. We are “dyed-in-the-wool” recyclers and use pre-loved top quality wool fabrics & yarns whenever we can! 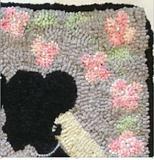 Our 24” x 46” hand hooked rug is named “FLOWER QUILT” because it is reminiscent of a quilt with a blanket stitch border. Rug is hooked with peach, periwinkle blue and copper tweed wools and finished with a black whipped stitch edging. Black twill binding finishes off the back. Our hand hooked snowman looks cold against a gray background contrasted with ice blue contrast. He is really proclaiming “Winter” in his seasonal style. 12” x 23” mat is edged in coordinating gray and muted celery tone wool rug braiding. Rug braiding adds extra life to hooked rugs. Mat can be used on your floor, table, sofa or as a wall hanging. Mat can be used on your floor, table, sofa, or as a wall hanging. Such detail in this lovely semi-circular Basket of Strawberries! Hand hooked from a vintage Joan Moshimer pattern, background is black with gray/black tweed introduced as contrast. Intense shading of reds and mottled pinks make the delicious berries stand out. 24" x 41" rug is framed in black and white herringbone welting. Eight Kitties 18" x 22" "Granny Quilt Style"
This uniquely designed, hand drawn and hooked wool rug measures 20” x 35”. Our 8 kitties are presented in a “granny square” design in a black background with contrast. Rug is backed with burlap for longer wear and stability. Our Storybook rug tells the timeless story of little Goldilocks and the Three Bears. Here she is caught eating their breakfast porridge. Is it too hot, too cold or just right?. George Washington "I Cannot Tell a Lie"
Whether you are political or just plain patriotic, this one of a kind rug is for you. Whimsically hand hooked wool rug measures 19" X 26" and is bound in gold cotton fringe. Washington, Capital building, White House and shapes all stand out sharply against a navy blue heather background. Any gardener will love this hand designed and hooked 16” X 18” rug with sunflowers, posies, fresh fruit & garden tools in a brown tweed basket. The gray and taupe tweed wool background is double bordered with a black & white tweed outline and gray wool welting. Early Morning Cast measures 22" x 28" (oval) edged in rope brown wool braiding. Mottled sky colrs captures the morning glow in contrast to the turquoise and dark blue water mix. Excellent gift for that fisherman in your life! If you want your own special kitty’s colors in a mat, send us a picture and we can custom design it for you! Cape Cod Lighthouse is framed by a mottled blue and white sky. Water colors are turquoise and blue tweed with mottled accents. Rug/Mat measures 18" square which includes rope brown wool braided edge. "Whale with a Sailing Tail", depicts the traditon of a Nantucket Sleigh ride or whale hunt. Rug measures 13" x 30 1/2". Mottled blue and white sky is set against the water layers of rich blue and aqua tweed. Rug is framed by a brown tweed hooked rope border. Spring isn’t too away for this little gray bunny as he runs among pastel colored tulips on a background of LIGHT TAUPE wool. All hand hooked in #6 cut 100% wool fabric, this 18” X 18” rug is edged in a braid of maize and brown wool. Calling all horse lovers! Our 20” x 26” hand hooked wool rug features a black horse hooked in mottled black and surrounded by loden green. Rug’s edge is finished with tomato red and loden green plaid wool rug braiding. Braided edge adds extra life to a hooked rug! Background is 100% gray wool strips with contrasting gray textured wool. Runner is edged in gray tones of wool rug braiding. WHO wouldn't love this piece of nature in their home? 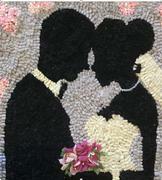 This 18" x 20" wedding rug is uniquely designed, hand drawn and hooked for that special day. 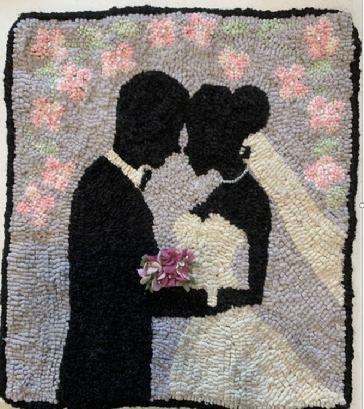 The Bride and Groom black silhouettes stand out against a gray wool background. Bride is wearing a white sparkle wool dress and veil, a tiny pearl necklace, and holds a prodded wool flower bouquet with pearl centers. Surrounding the couple are cherry blossoms with pearl centers. The edges of the rug are whipped with black wool yarn. The rug is bound on back with pink twill binding and has a rod pocket for wall hanging, if desired. It must be Spring! Our Black Cat is enjoying the blooming black-eyed susans…. and so is a little bird. This is an original design which has been hand drawn and hooked with 100% wool strips. Oval rug is 21" x 28" and is edged with green & yellow wool braiding. A braided edge frames the rug as well as extends the rug's lifespan.